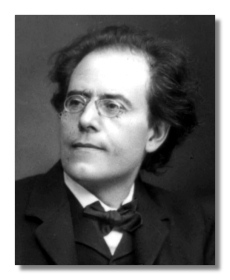 Mahler was born on July 7, 1860, in Kalischt, Bohemia, to the owners of a brandy distillery. Gustav was the second of twelve children born to Bernhard and Marie Mahler, six of whom died very young and one of whom committed suicide. Gustav did show a musical precocity and Bernhard, open to his son's talent, began paying for piano lessons. Gustav gave his first public recital in Iglau at the age of ten, before finding his way to the Prague Gymnasium and Vienna Conservatory. His conservatory period was generally a success, having won awards for piano playing and composition, but having first dealt with the anti-Semitic views of Vienna's musical establishment. Mahler chose to conduct while earning a sparse composing income, working through the smaller halls of Bohemia and Hungary before establishing himself as a podium tour de force with appointments in Prague (1885-6), Leipzig (1886-8), Budapest (1888-91), Hamburg (1891-7), and, ultimately, Vienna (1897-1901). Mahler was popular in his conducting role, leading revolutionary changes in orchestral repertoire and how opera, particularly Wagner, is presented. The personal life of Mahler, even with its depth of success, was remarkably troubled. His harsh rehearsal methods and dealings with musicians were widely criticized, although many were fascinated by his leadership and considered his performances to be on an entirely different level. His Jewish background made him even more of a target for Vienna's racist newspapers, imposing pressure to which he later caved. He converted to Roman Catholicism while in Vienna for political reasons, overlooking his true faith. Mahler's ten-year marriage to Alma Maria Schindler barely escaped divorce, having been strained by their age difference of 19 years, his identity problems, and the death of their five-year-old elder daughter, Maria Anna. A psychoanalytical discussion about their marriage between Gustav Mahler and Freud is very well-known. Mahler's compositional output is almost entirely of symphonies and lieder . He never wrote a complete opera, despite making such a large contribution to operatic design and presentation. Of his nine full symphonies, the Second ( Resurrection, premiered 1895), Third ( Pan, 1902), and Eighth ( Symphony of a Thousand, 1910) are arguably the most popular with listeners. His song canon is extensive, including the cycles Lieder eines fahrenden Gesellen (Songs of a Wayfarer), Kindertotenlieder (Songs on the Deaths of Children), Des Knaben Wunderhorn ( The Youth's Magic Horn), and Das Lied von der Erde (The Song of the Earth). For those who find the symphonies less appealing, the songs are easily approachable and beautiful in tone. The style of Mahler is late-Romantic, along the lines of Anton Bruckner, Richard Wagner, and Alexander von Zemlinsky. Although tending to use the classical forms of sonata and scherzo, his themes typify the anxious fin-de-siécle mood that took hold of Europe during his era. While drawing closer to the world of New Music - atonality - he expanded the Romantic orchestra to its breaking point. His Eighth Symphony, divided into two parts on an ancient church hymn and the transfiguration scene from Goethe's Faust, requires some one thousand performers, including eight vocal soloists, adult and children's choirs, quadruple winds, two harps, large percussion section, and organ. Naturally, Mahler's commitment to new sounds and his idea of the symphony as an "entire world" were unpopular but for a small group of Viennese admirers. But the group did include Arnold Schoenberg, Alban Berg, and Anton Webern, who led the Germanic musical world through later years.